History: Valencia was founded in 138 BC as a settlement for regular soldiers under the consulate of Decimus Junius Brutus and then razed and practically abandoned in 75 BC. After that, Valencia saw first regrowth and then further decadence until the Church siezed control in the 5th Century. Valencia was also host to Visigoth armies during the Byzantine invasion of the peninsula in the year 554AD. The moors installed themseves following the conquest of 711AD and except for a period spanning between the end of the 11th Century and the year 1102 where El Cid restored Christian control of the city, Valencia saw 5 centuries of Muslim culture of various sorts and which ended with Jaime I’s conquest in 1238. The Muslim's expelled, the land was divided between those who had helped Jaime I achieve victory. Record of this was made in the Llibre del Repartiment. Valencia was then to enter a period of progress that would see the creation of a new set of laws and a social structure that laid the foundations for the Valencia of today. The 14th century would see many troubling events in Valencia. It would see the Black Death in 1348 which, together with subsequent epidemics, would decimate the population. Valencia would also lead a popular revolt against the excesses of the monarchy in the War of the Union and then finally the war with Castille and the success in repelling the Castilian forces, first in 1363 and then a second time in 1364, earned Valencia the double "L", signifying "twice loyal", for its coat of arms. The 15th century was a time of splendour and growth, both economically and artistically, with Valencia becoming one of the most important trading emporiums of the Mediterranean thanks in great part to its booming silk trade. Painting and sculpture would reflect mostly Flemish and Italian influences and literature would also make its mark thanks to the patronage of the court of Alfonso V. Architecture would also boom, many of Valencia's most prominent buildings such as the "Torres dels Serrans", the Exchange, the "El Micalet" bell tower and the church of "Los Reyes del Convento de Santo Domingo" would be built during this century. Valencia saw its society divided into two groups, with peasants, artisans and some members of the lower middle classes taking up arms against the nobility, subject Moors or Moriscos and wealthy upper classes, in what was called the revolt of the Germanías or Brotherhoods. Although the Brotherhoods took control of Valencia in 1519, they then lost it in 1520 and soon after the movement was destroyed. The Renaissance would finally reach Valencia but its ideology would have little impact on the population; its influence being contained to the Court of the Vicereine Germana de Foix. The 17th century was characterised by social unrest at King Felipe IV's absolutist ideals and constant interference in areas where the city had its own powers and aggravated by a revolt in protest of unfair taxes on production and consumption. Plagues in 1647 and 1652, which cut the population by a third, and the flooding of the river Turia in 1651 added to social unrest. Despite all of this, it was a century of ceremonious royal arrivals, religious fervour, public functions and processions which would bring about the decoration and transformation of the streets of Valencia into something so awe-inspiring that it still influences the traditional celebrations of today. The 18th century was the century of Enlightenment and also the time of the Spanish War of Succession which would see Felipe V of the Bourbon Dynasty as King. He would bring about the abolishion of the Valencian charters and the integration of Valencia and its Kingdom into the laws and customs of Castile. The silk trade would again play an important part in the recovery of the Valencian economy. The Enlightenment movement would bring about improvements in agriculture and industry and would promote many cultural, civic and financial institutions. Despite the impact the French Revolution had in Valencia and the changes of the governing powers initiated by the abdications of Carlos IV and Fernando VII, there were some positive changes in the 19th century. Improvements to health and public safety measures would be made and the landscaping of large areas of the city would occur. In 1833 the hereditary system used until then for town council posts was replaced by a system of suffrage and the provinces were created. Local economy would flourish thanks to agricultural, financial and industrial advances and huge improvements would be made to infrastructures and services. 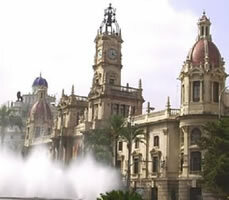 The end of the 19th century would see Valencia grow and develop greatly. In the 1870’s, a cultural movement called La Renaixença would emerge to restore the Valencian language and local traditions. In 1957 Valencia would suffer the worst flooding of its history and in the '60s the Turia would undergo a transformation to divert the flow of water in order to prevent future flooding. After Franco's death in 1975, a democratic transformation began. In 1978 the Spanish Constitution was approved and the Autonomous Community of Valencia sprang to life with the Statute of Autonomy and the Valencian language and culture would recover. The last 20 years has seen Valencia transformed enormously with projects such as the creation of the Turia Gardens, the metro (underground), the Valencia Institute of Modern Art, the City of Arts and Sciences, the Palau de Congresos (conference centre) amongst others, helping Valencia become what it is today: a modern city, rich in history, that embraces the future and able to host events such as the 2007 edition of the America's Cup. Attractions: Valencia is a city where a multicultural history meets modern architecture without losing anything; religious temples, Gothic Barroque and Modernist monuments, great museums, innovative architecture all stand side by side. Some of its well known attractions are the "Torres dels Serrans", the Exchange, the "El Micalet" bell tower, the church of "Los Reyes del Convento de Santo Domingo" and the city of Arts and Science. Thanks in part to its close relationship with the sea, Valencia hosts the 32nd edition of the America's Cup in the year 2007. For sport fans there are also many interesting alternatives and it is possible to practice all types of sports (water sports, golf, soccer, etc.) or to experience sports events such as the games of the well known, particularly on a European scale, Valencia soccer club. Valencia also has several well known festivals, perhaps the most renowned of them being the Fallas, held mid-March, where hundreds of huge cardboard or plastic monuments atop wooden structures, and representing everyday people and situations in an artistic and humourous or satyrical way, take to the streets for several days, finally to be purified by flames on the night of Saint Joseph. Going Out: Valencia has an interesting and intense nightlife, proof of which is given by those with enough stamina to form part of a so-called "Movida", which consists of going out on a Friday and not returning home until the Sunday. For those wishing to go out to a pub, the Avenida de Aragon or areas such as Xuquer, Juan Llorens or Canovas are popular amongst different groups of people. If you prefer to dance you can try the Viveros area or the Avenida Blasco Ibañez. And for those who wish to start off the evening with a few tapas, try the area around the Plaza de la Virgen in the historical part of town. The beach is also popular, especially in Summer, as a place to spend outdoors with family and friends and has a great number of restaurants and places to have tapas. 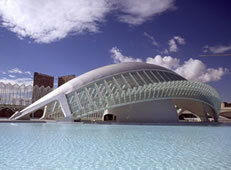 For further information about Valencia we can recommend this Valencia City Guide where you can find a lot of interesting information about the city of Valencia and in this Valencia Guide you can find useful facts about the city of Valencia and other interesting information. If you are looking for accommodation in Valencia take a look at this site where you can find further information about renting apartments in Valencia for long term rents as well as for vacation rentals.